Private and tranquil property that is a built in 5th wheel home. Connected to the home is a large add on room for extra living or entertaining space. 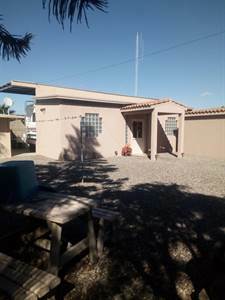 There is a separate casita that is self contained with kitchen, bedroom and bathroom. Property is surrounded by a 7 foot block wall for complete privacy. Outside has huge kitchen for cooking. Patio area is shaded with beautiful trees and plenty of relaxing space.